In the middle of 2016 we packed up and moved from shakey Christchurch, New Zealand and put down roots on the sunny Gold Coast, Australia. Now we are settled, I’m hoping to get back into blogging a bit more frequently. Typically, I blog about travel, pets and other random items as the mood takes me. I am also working on a personal project to share my Grandfather’s WW2 diary and photographs. I strongly believe life is too short to have just one midlife crisis so I am usually planning a whole series of them, mostly involving travelling to amazing places with a smattering of Disney thrown in to keep my inner child happy. I won’t say I’m a budget traveller, I’m more a mid-range traveller who watches my budget. Most of my trips are 2-3 weeks at a time… some of us have to work for a living 🙂 Speaking of which, I am an IT geek by profession and consider myself lucky to have a career I love. In terms of the name of my blog, I love socks, and I think I have a pair in every colour imaginable. During the Christchurch earthquakes, we were requested to minimise water usage due to damaged sewer system. I was startled to find I could go 14 weeks without having to wash a pair of socks. I guess there are worse things to collect. I hope you enjoy my blog, I love getting feedback so please let me know if you like it or if you have a question about anything I post. You can also follow me on Twitter @paula_from_nz and Instagram 14weeksworthofsocks. Hey P. :))) Glad you found my blog!! I’m still learning my way around WordPress 🙂 Glad I found you! Hello from Canada! Glad I found your blog! Love hearing about your adventures! MJ from Ontario! Dearest Sock Mistress… thank you once again for nominating Tomboy Travels for the Liebster Award. I really appreciate it and have loved paying it forward. Cheers! Hi!! Your blog title caught my attention!! Greetings from a Canadian living in Taiwan! Hiya! I have a question for you – do you lose socks in the wash? If not, what is the secret to keeping them “paired up”? 🙂 Guess the different colours makes it easier to match? Anyway, happy to have stumbled across your blog and to follow you! As foreignsanctuary mentions – the title too caught our attention! There are actually two solutions to this problem. 1) Buy all your socks in exactly the same design/colour/style so you always have a matching pair (BORING!). 2) Buy brightly coloured socks (my method). Pretty sure that the pair I’m currently wearing wouldn’t go astray in the wash or be difficult to match (pink knee high with purple, crimson and orange polka dots). I also think gives a certain air of professionalism when visiting clients. Thanks. Pleased to have found your blog. Brilliant title! I’ll explore more. Regards from Thom at the immortal jukebox (plugged in now). Thanks for stopping in at my blog – glad you like it. I will be sure to check out your blog also. Thank you for following my blog, I hope you will enjoy reading about my lunches. I just wish someone would make me such delicious looking meals! 🙂 Thanks for the follow too. We love your blog so much! It is great fun to read. 🙂 We nominated you for the Very Inspiring Blog Award. You don’t need to make a response post if you do not wish to– we just wanted to take the time to recognize you. I’ve read your about and you sound like a typical Kiwi. i.e. you are probably crazy and you don’t believe there is any sport that you can’t beat Australia in. And I usually end up like Kiwis even if they speak a little strangely. I think I might just enjoy your blog. But you have to check mine out as well. In other words a comment now and then. I’ll try to keep the history blog rolling. And thanks for your follow. If you have any monuments that fit I love a photo to add to mine. Thanks for following Flying Goannas. I hope you enjoy our travels. The first thing I saw on your blog was Grandad’s WWII Diary. I know what I’m doing for the rest of the weekend. Plus I’m going to reblog it because I know lots of people who would be interested in reading this. Thanks so much for the reblog. I would love for others to read about my grandfather’s experiences during the war. People need to know what they experienced and for the most part, they never spoke of it. I know I have thanked you for this already, but here is a follow-up to the nomination you made back in September. Thank you once again and have a safe and happy new year! Thanks for following my blog – you’re very entertaining. Hi there! Firstly, I love the name of your blog! 🙂 Your posts are enjoyable to read. NZ has been on our wishlist for years. Look forward to reading more posts of your adventures. Always fun to read about who and why a blog was created. Now to talk socks! I need to step up my fun (patterns/designs) sock buying. I’ve noticed if there is a pair of socks for a ridiculously low price, they don’t stand up to more than 7 uses or so. Is there a brand or place you usually purchase socks from? A place, store you typically purchase from? The socks I’ve bought at say, JoAnn’s Fabrics don’t last more than 5 wears. I’m in New Zealand but when I’ve been in the US, I have bought socks in Target and Walmart. I’ve also bought on eBay. Hmm. When I get done with my prolonged mid-life crisis, I’d like to join your travel expeditions! New Zealand–yet another place I’ve never been, though I’ve had students from NZ–who actually returned to NZ. Thanks for the visits and follow! I’m so pleased to meet you. I’ve seen your gravatar out there, and wondered what was up with the 14 weeks worth of socks! Now I know. Glad you found my blog 🙂 NZ is a wonderful place, I hope you make it here sometime! haha, I couldn’t help myself but laugh so hard when I read ” could go 14 weeks without having to wash a pair of socks”. You are right, there are worse things to collect !! 😀 so, when you go on holiday, you take a new pair for everyday or you do some little laundry over there ? Great question about socks! I sometimes do laundry, sometimes buy new socks (like I need more, right?) and often take old worn socks to throw away – I like to think of it as having a last holiday with a beloved pair. I appear to have a year’s worth of unmatched socks. What’s your secret??! Should one die an untimely death, I will sometimes match with another widowed one of the same type, length etc for one last holiday. Thanks, I also look forward to reading more of your blog 🙂 Thanks for stopping by. I’m sorry, but I just have to stalk follow you, if only for the doglets! Haha a great reason :-). Welcome and thanks for the follow! Very cool blog! Can’t wait to look around some more. BTW your pup is adorable! Thank you – I think she’s adoreable – check out my “Pets” section as there are a bunch of posts about her and her sister and her now passed siblings. I love your tagline – thanks for the follow! Pretty funny stuff though I know, too, you’re dead serious—which is the best part of it. I’ve got my own pet theory on The Walking Dead, btw. . .which, I confess, I’ve used to numb myself out to oblivion. Nice to find you and follow you. Now I am going to go count the socks in my sock drawer. 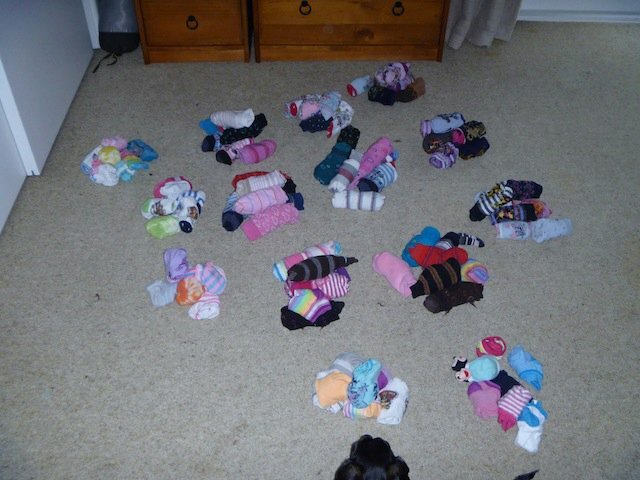 I am too scared to count, I suspect I might have to rename my blog to 15 weeks or more of socks. Gulp! Thanks – I’ll see how I go, I’m kinda getting into the swing of a new job and schedule currently but I appreciate the nomination.